Several terms redirect here. For other uses, see Class war and Class Struggle. The Pyramid of Capitalist System is a simple visualization of class conflict. Class conflict (also class warfare and class struggle) is the political tension and economic antagonism that exists in society consequent to socio-economic competition among the social classes. In the political and economic philosophies of Karl Marx and Mikhail Bakunin, class struggle is a central tenet and a practical means for effecting radical social and political changes for the social majority. The forms of class conflict include direct violence, such as wars for resources and cheap labor; indirect violence, such as deaths from poverty and starvation, illness and unsafe working conditions. Economic coercion, such as the threat of unemployment or the withdrawla of investment capital; or ideologically, by way of political literature. Additionally, political forms of class warfare are: legal and illegal lobbying, and bribery of legislators. The social-class conflict can be direct, as in a dispute between labour and management, such as an employer's industrial lockout of his employees in effort to weaken the bargaining power of the corresponding trade union; or indirect, such as a workers' slowdown of production in protest of unfair labor practices, such as low wages and poor workplace conditions. 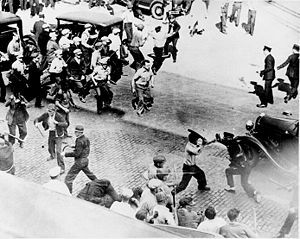 Social-class warfare: Truck drivers fight the police in the course of the Minneapolis Teamsters Strike of 1934. In political science, Socialists and Marxists use the term class conflict to define a social class by its relationship to the means of production, such as factories, agricultural land, and industrial machinery. The social control of labor and of the production of goods and services, is a political contest between the social classes. The anarchist Mikhail Bakunin said that the class struggles of the working class, the peasantry, and the working poor were central to realizing a social revolution to depose and replace the ruling class, and the creation of libertarian socialism. In contrast, Marx's theory of history proposes that class conflict is decisive in the history of economic systems organized by hierarchies of social class, such as capitalism and feudalism. Marxists refer to its overt manifestations as class war, a struggle whose resolution in favor of the working class is viewed by them as inevitable under plutocratic capitalism. In the speech "The Great American Class War" (2013) the journalist Bill Moyers acknowledged the existence of social-class conflict between democracy and plutocracy in the U.S. Chris Hedges wrote a column for Truthdig called "Let's Get This Class War Started," which was a play on Pink's song "Let's Get This Party Started." A variety of predominantly Trotskyist and anarchist thinkers argue that class conflict existed in Soviet-style societies. Their arguments describe as a class the bureaucratic stratum formed by the ruling political party (known as the nomenklatura in the Soviet Union), sometimes termed a "new class", that controls and guides the means of production. This ruling class is viewed to be in opposition to the remainder of society, generally considered the proletariat. This type of system is referred by them as state socialism, state capitalism, bureaucratic collectivism or new class societies. (Cliff; Ðilas 1957) Marxism was such a predominate ideological power in what became the Soviet Union since a Marxist group known as the Russian Social Democratic Labour Party was formed in the country, prior to 1917. This party soon divided into two main factions; the Bolsheviks, who were led by Vladimir Lenin, and the Mensheviks, who were led by Julius Martov. However, many Marxist argue that unlike in capitalism the Soviet elites did not own the means of production, or generated surplus value for their personal wealth like in capitalism as the generated profit from the economy was equally distributed into Soviet society. Even some Trotskyist like Ernest Mandel criticized the concept of a new ruling class as an oxymoron, saying: "The hypothesis of the bureaucracy’s being a new ruling class leads to the conclusion that, for the first time in history, we are confronted with a “ruling class” which does not exist as a class before it actually rules." According to Michel Foucault, in the 19th century the essentialist notion of the "race" was incorporated by racists, biologists, and eugenicists, who gave it the modern sense of "biological race" which was then integrated to "state racism". On the other hand, Foucault claims that when Marxists developed their concept of "class struggle", they were partly inspired by the older, non-biological notions of the "race" and the "race struggle". Quoting a non-existent 1882 letter from Marx to Friedrich Engels during a lecture, Foucault erroneously claimed Marx wrote: You know very well where we found our idea of class struggle; we found it in the work of the French historians who talked about the race struggle. For Foucault, the theme of social war provides the overriding principle that connects class and race struggle. Newport Rising political revolt in 1839 led by Chartists. ^ The New Fontana Dictionary of Modern Thought (1999) Allan Bullock and Stephen Trombley, Eds., p. 127. ^ Marx, Karl; et al. (1848). The Communist Manifesto. : www.marxists.org. ^ Moyers, Bill (12 December 2013). The Great American Class War Archived 2013-12-22 at the Wayback Machine. Brennan Center for Justice. Retrieved 25 January 2014. ^ The Pathology of the Rich - Chris Hedges on Reality Asserts Itself pt1 Archived 2013-12-09 at the Wayback Machine The Real News. 5 December 2013. Retrieved 25 January 2014. ^ Hedges, Chris (20 October 2013). Let’s Get This Class War Started Archived 2013-10-21 at the Wayback Machine. Truthdig. Retrieved 25 January 2014. ^ Full Show: The New Robber Barons Archived 2014-12-23 at Wikiwix. Moyers & Company. December 19, 2014. ^ Jefferson, Thomas. "Letter to Edward Carrington - January 16, 1787". Archived from the original on January 16, 2013. ^ "The World's Billionaires". forbes.com. Archived from the original on 24 April 2013. Retrieved 1 May 2018. ^ Buffett, Warren (Nov 26, 2006). "In Class Warfare, Guess Which Class is Winning". The New York Times. Archived from the original on 2017-01-03. ^ Buffett, Warren (Nov 2011). "Stop Coddling the Super Rich". The New York Times. Archived from the original on 16 May 2012. Retrieved 16 May 2012. ^ Cockburn, Alexander (18–20 February 2011). "The Tweet and Revolution". Archived from the original on 2011-02-27. ^ Korotayev A, Zinkina J (2011). "Egyptian Revolution: A Demographic Structural Analysis". Entelequia. Revista Interdisciplinar. 13: 139–165. Archived from the original on 2016-10-20. ^ "Demographics of the Arab League, computed by Wolfram Alpha". Archived from the original on 2011-03-02. ^ "Ahmadinejad row with Khamenei intensifies". Al Jazeera. 6 May 2011. Archived from the original on 20 April 2012. ^ Javid, Salman Ansari (27 January 2011). "Arab dictatorships inundated by food price protests". Tehran Times. Archived from the original on 14 June 2011. Retrieved 13 February 2011. ^ Harpal, Brar (October 1993). Trotskyism or Leninism?. London. p. 647. ISBN 1874613036. ^ Ernest, Mandel. "Why The Soviet Bureaucracy is not a New Ruling Class (1979)". Archived from the original on 22 May 2017. Retrieved 26 April 2017. ^ Collins, Patricia Hill (March 2000). "Gender, black feminism, and black political economy". Annals of the American Academy of Political and Social Science. 568 (1): 41–53. doi:10.1177/000271620056800105. Dahrendorf, Ralf (1959). Class & Class Conflict in Industrial Society. Stanford University Press. ISBN 0-8047-0561-5. (also available in hardback as ISBN 0-8047-0560-7 and ISBN 1-131-15573-4). Faux, Jeff (2006). The Global Class War: How America's Bipartisan Elite Lost Our Future and What It Will Take to Win It Back. John Wiley and Sons. ISBN 978-0-471-69761-9. Li Yi (2005). The Structure and Evolution of Chinese Social Stratification. University Press of America. ISBN 0-7618-3331-5. How a Real Class War, Like with Guns, Could Actually Happen. Vice, November 26, 2018.